Among the enjoyments many readers of poetry share are the memories of a number of favourite poems on various subjects – love, birth, a summer evening, death, winter, cats, spring, childhood, autumn . . . . Wittingly or not, most of us who read poetry for pleasure create small personal anthologies which surprise us occasionally: when faced with a particularly bracing Spring day, for example, we may find ourselves recalling lines which somehow distil Spring’s essence: Nothing is so beautiful as Spring, when weeds in wheels shoot long and lovely and lush . . .. Or on a winter morning after a fresh fall, we may find we are looking at the frolic architecture of the snow. We are no different, and in the mood to find a small project for the press when two or three larger projects were still in preparation and some way from being ready to start, we set out to collect four little anthologies of favourite poems about the four seasons. (Perhaps it was also conceived as a specific against hearing the 3,873rd new recording of Vivaldi’s Four Seasons on the CBC.) The first pamphlet, Upon Vermilion Wheels, was ready for the Oxford Fair in 2011, where it sold very well. 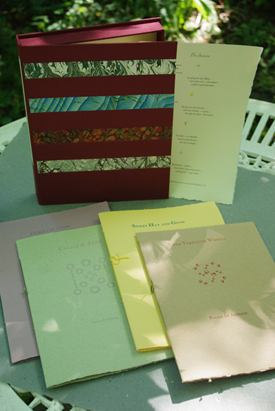 We had reserved a number of copies for inclusion in sets, and when the other three were produced in early 2013 – 2012 having passed in a blur of various writing and designing projects – we were able to assemble sixty boxed sets of the four pamphlets under the title The Seasons: Four Bagatelles. The texts of all of the pamphlets are printed in 12pt Bembo and Fairbanks, but each uses a different display face for the titling, has its own second colours, and is printed on a different paper, two of them handmade. They are sewn into handmade coloured cover stocks, and sewn with specially dyed silk thread. Unique to each is a selection of ornamental arrangements devised for the edition and set by hand; these vary from small spots to full-page ornaments, and at least one of them in each pamphlet is printed in two or more colours. Upon Vermilion Wheels, the title taken from a poem by Emily Dickinson included in the selection, has Champlevé for display, is printed in red, gold, and black on vintage Barcham Green Tovil laid, and is sewn into a wrapper of BG Robin cover. The poets include Emily Dickinson (the only poet represented in all four pamphlets), P. K. Page, John Clare, Gerard Manley Hopkins, and Rainer Maria Rilke. Stories of Snow takes its title from a poem by P. K. Page. Its display type is Elysian, with ornaments printed in grey-blue and mauve, on Biblio mouldmade paper, with mauve wrappers handmade by David Carruthers at the Papeterie St-Armand in Montréal. There are poems by Ralph Waldo Emerson, Thomas Hardy, Archibald Lampman, and Heather Simeney MacLeod, among others. Calice & Stem derives its title from a poem by Crispin Elsted. The display types are Egmont initials and Fournier le jeune, the text paper is Heine, and the wraps are a grass green St-Armand handmade cover. The ornaments are printed in pale green, pink, and rose. Poems include selections by Jan Zwicky, Francis Beaumont, Alfred Lord Tennyson, John Clare, and a poem from the Harley lyrics. The title of Sweet Hay and Gone is taken from a line by Molly Holden. The titling is Demeter, and the colours for the ornaments are light green, emerald green, deep yellow, pure blue, and orange. The text paper is Rideau handmade from Papeterie St-Armand, and the covers are St-Armand butter yellow. There are poems by Geoffrey Chaucer, William Morris, Walt Whitman, Jan Zwicky, George Meredith, and others. 60 sets of the four pamphlets were gathered together and presented in a clamshell box designed at the press, with four strips of seasonally coloured marbled paper by the late Ann Muir laid in across the lid. Accompanying the pamphlets in these sets was a single sheet of four haiku in r?maji with English versions by Crispin Elsted, printed in Bembo and Fairbanks on vintage Wookey Hole Invicta handmade paper, with decorations in green, yellow, gold, and blue, and Locarno italic for display. Individual pamphlets, various papers sewn into various handmade wrappers, printed on upper cover. Bembo and Fairbanks with various display types as above, in several colours. Typographical ornamentation in each. Visit our Ordering page to place an order for these titles.